The picture appeared in the One Show, winning a merit award, and at Cannes International Advertising Festival, winning no award. But recently, when the ad was circulated in a press kit sent out by DDB Brasil, complaints started coming through to WWF about the inappropriate nature of the campaign. Despite the facts in the print advertisement being correct, (the 2004 tsunami had a much more severe death toll), it is not considered respectful to minimalize the sufferings of those who have suffered the trauma associated with the September 11 attacks. WWF, whose international headquarters is in Switzerland, raises 45% of its income from the United States, the United Kingdom, and the Netherlands. Offending the United States didn’t make sense. WWF at first denied that the ad had ever been approved or placed. However In a joint statement from WWF Brazil and DDB Brasil, posted on the ad agency’s website, they admitted that the press ad was “created and approved” for use, but not circulated. Just when things got bad, they got worse. The television commercial, produced in association with the print advertisement, turned up on YouTube. 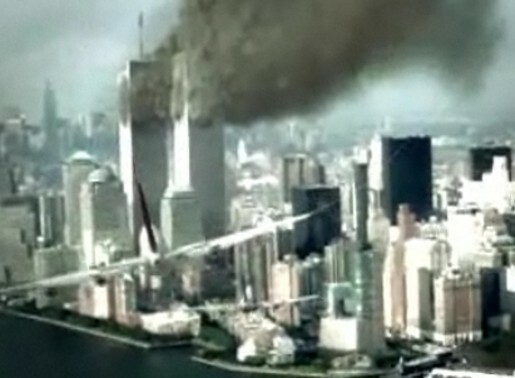 We see two airplanes blowing up the WTC’s Twin Towers. Lettering reads that 2,819 people were killed in the tragedy. Cuts back to image. We see hundreds of airplanes invading the screen. Before they hit the buildings, enters second lettering reminding us that the tsunami killed 100 times more people, although it wrongly puts the tsuanmi in 2005. The film then asks us to respect a planet that is brutally powerful. The video has now been removed by DDB Brasil. The One Club is implementing strict new rules that ban agencies and individual members of creative teams — found guilty of making fake ads for a period of five years. An agency or regional office of an agency network that enters an ad made for a nonexistent client, or made and run without a client’s approval, will be banned from entering the One Show for five years. The entire team credited on the “fake” entry will be banned from entering the One Show for five years. An agency or regional office of an agency network that enters an ad that has run once, on late-night TV, or only because the agency produced a single ad and paid to run it itself will be banned from entering the One Show for three years. Tsunami was developed at DM9 DDB Brasil, Sao Paulo, by chief creative officer Sergio Valente, executive creative director/copywriter Rodolfo Sampaio, executive creative director Julio Andery, creative director/art director Guilherme Jahara, copywriter Adriano Matos, account supervisors Alcir Gomes Leite and Ana Paula Grassmann, working with advertiser’s supervisor Heloisa Helena De Oliveira, art buyers Carmen Castillo, Carolina Galastri and Clariana Da Costa, agency producers Gilberto Pires (Gibinha) and Vanuza Passos. Sergio Valente has issued an apology on behalf of DDB Brasil. He says that while the work was created by a junior team seeking to make the point that nature is a powerful force, the work should never have been approved by anyone at the agency, let alone run anywhere or submitted for awards. The work, which ran once in print and on cable, and the attention, concern and offence it has caused, has underscored the point that no ad is truly just local. He emphasises that the work does not reflect the agency’s opinions on 9/11. Photography from Getty Images was retouched at Big Studios by producer Nereu Marinho and Edson Harada. Filming was shot by director Luciano Neves at Tribbo Post, Sao Paulo, Brazil, with producer Andre Pulcino. Sound was designed at Saxsofunny. “WWF Brazil asserts emphatically that the message of the ad “Tsunami” does not reflect under any circumstances the opinion of the organization and its staff members. We do vehemently repudiate its publication and circulation. Relating acts of terrorism, which killed thousands of people, with the effects of climate change is abhorent and has nothing to do with the message that we seek to convey in achieving our goals of conserving nature and using natural resources sustainably. Created by the publicity agency DM9DDB, this piece was presented to WWF-Brazil in December 2008, and we did not approve its circulation. 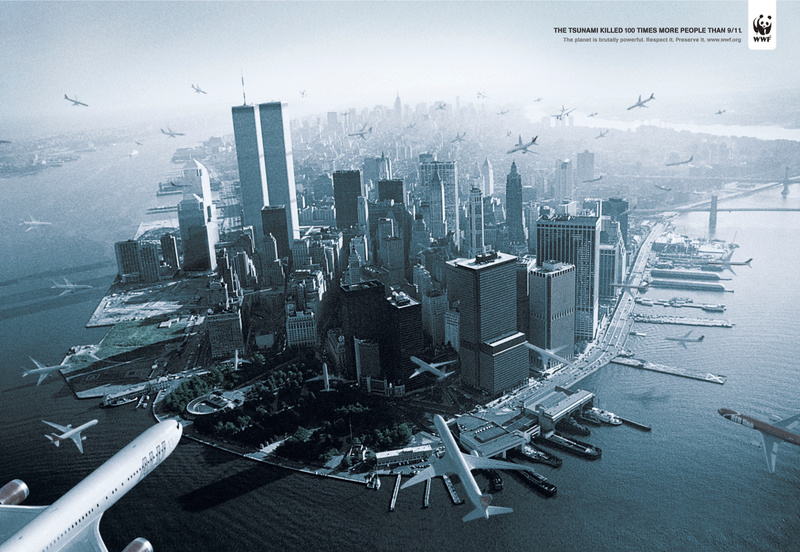 According to DM9DDB, “the Tsunami ad for World Wildlife Fund was created by a team at DDB Brazil in December 2008. That team is no longer with the agency. DDB Brazil apologizes to anyone who was offended or affected by the ad. It should never have been made and it does not portray the philosophy of the agency”.